We hear this all the time in world of Internet marketing to the point where it’s almost become a cliche. However, there’s probably a reason why testing is so emphasized in regard to email, right? Successful testing helps you predict how your campaigns will perform once you roll out the real deal. Which will offer you peace of mind and keeping cash in your pocket. But keep in mind that not all tests are created equal. You need a strategy in place to ensure that your tests don’t fall flat. After all, flying blind with your testing will get you nowhere. In fact, failing to properly measure your metrics or under what you’re testing may leave you more confused than you were before you started. 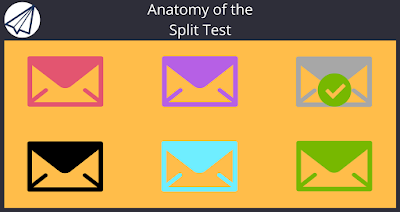 The question remains: what does a successful split test actually look like? We’ve outlined the following tips to ensure that your testing efforts are focused andare measuring the proper metrics. So you can make data-driven decisions to beef up your future marketing messages. There are plenty of elements you can test; from the use of imagery to CTAs, each piece of the puzzle plays its role in your campaign’s potential success. That said, most marketers prioritize subject lines. As a successful subject line will ultimately determine whether or not your messages get opened at all. Since you can’t measure any other metric without understanding what makes readers click through. Subject lines are a solid place to start. Beyond subject lines, your click-through rate is arguably the second most important metric to determine whether or not your messages resonate with readers. Perhaps the biggest mistake the newbies make when testing their emails is trying to do too much without actually understanding what metrics they’re trying to measure. Think about it: there are so many variables to any given email that you have to hone your efforts on a single metric versus a million moving pieces at once. Keep in mind that these sorts of variables can also apply to your CTAs and click-through rates as well. So, how can you possibly wrangle the most important metrics of your campaignwhen it comes time to test? The key to a successful test is to include a variety of messages during your blast. Each distinctly defined by their variables. Each of these subject lines can be shortened and lengthened accordingly based on your message: the more you play with your messages, the more data you can gather once you’ve begun testing. While it may seem like a lot of initial legwork in the form of brainstorming and ideation, the results of your tests may be paramount to determining what reallymakes your readers tick. Split testing represents a cornerstone of email marketing: although tests can be quite involved, they provide peace of mind as you uncover the absolute best way to reach your readership on a budget. Thankfully, you can make your testing campaigns much, much easier with a robust email automation solution such as Sendlane on deck. Use Sendlane’s Workflow module to set up an automated split test. Don’t have Sendlane then use our free trial to split test us against your current email marketing platform.